I happened to be in Nairobi for the first Skunkworks organized conference on local-grown mobile, web and desktop software – setup by Alex Gakuru. It’s a mixture of demos, with a scattering of talks by high-level sponsors and the Permanent Secretary of Information Dr. Ndemo. Kenneth Mwangi just gave a presentation on his new web and mobile payment application called Tulipe, which means “let’s pay” in Swahili. It’s most similar to PayPal in how it is setup, where you signup to use it on the web, and then can start using mobile phones for payment after the account is set up. Kenneth is in is final year at Strathmore University, well known for their tech programs, and this is his final project. The prototype is still being built, but it has a lot of potential. This is one of those ideas that a savvy business investor should jump on. Bonn Ndegwa is part of a company called Unwired Technologies, based out of Western Kenya, that works on what we call “tropically tolerant software”. In other words, they create desktop applications that work in rural, unconnected Africa on old computers. It’s a perfect example of Africans developing software for their own needs, instead of just importing solutions created for a different world. TimeTabler has a specific niche, they focus on serving the needs of schools putting together their schedules for both classes and teachers. 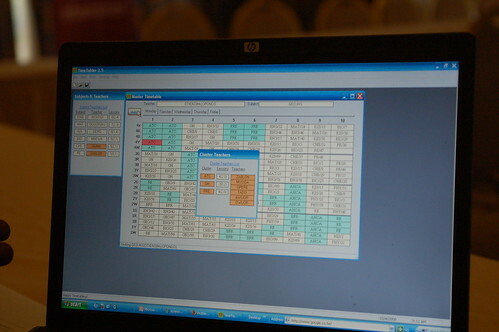 It doesn’t sound that exciting, but it is if you’re a headmaster that used to spend a week trying to do what now takes only an hour with TimeTabler. It’s simple, working off of an Access database, but it works – and that’s all that matters. Sam Kitanye and Victor Murage are talking about the Kikwe application that allows you to send airtime anywhere in the world (not just Africa). They use electronic inventory, so they bypass the need of keeping physical voucher inventory, which is very useful when you think about times when the shops run out. Scalable to any network, because you’re sending a pin number – if you tried to do this by keeping an account, SIM card or modem, that wouldn’t work. The airtime is sent instantly. Fraud is always a problem with these kinds of international transactions – especially when you’re dealing with airtime in Africa as it has become its own pseudo-currency. Victor talks about the ways they are tracking fraudulent activity, but past experience in this space reminds me of how difficult it is, made even harder as their product is instant. This is a good business idea for making money from the diaspora, assuming you can manage the fraud. 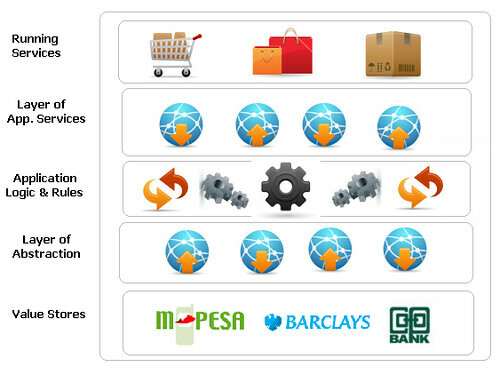 However, the achilles heel for use within Africa is (again) the lack of local payment systems to actually create the transaction. Hopefully they’ll get together with Kenneth of Tulipe (above) and figure something out. Mugambi is giving a review of the newer version of Jahazi (which I reviewed in it’s earlier stages). One place where you can get all your local information for Kenya. Mixing things, including email, news reader, SMS and local internet content. It’s another good example of home-grown software made for local markets, challenges and content. 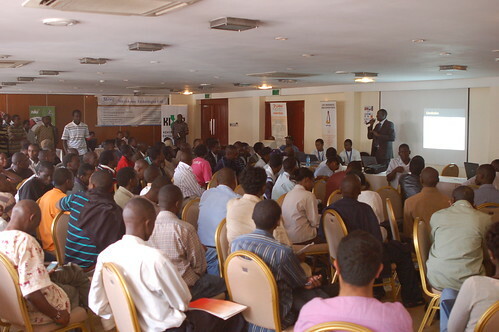 There has been a lot of talk in the Kenyan tech backchannels over the upcoming Barcamp Africa. Kahenya has a posted the email thread from the Skunkworks email list into his blog for further reading – it’s worth reading for context alone. The two biggest points of contention seem to be over the name “Barcamp Africa”, with the conference being held in the US, and the fact that Google has agreed to sponsor the facility for it to take place in. The first thing I’d say is, don’t get caught up in the nomenclature on this one. Barcamp Africa happening in Silicon Valley is being put on by a couple people who are from Africa, or have a vested interest in what happens here. From what I understand, it’s really only about drawing attention to African projects and initiatives in the world’s largest tech mecca: Silicon Valley. Could one/should one be held in Africa? Of course, but at a local, level like we already see in Kenya, Uganda, Rwanda, South Africa, etc. I’d also be interested in seeing one at a continental level, but so far haven’t seen anyone step up to take charge on that idea. I know for a fact that Kaushal and Ellen specifically didn’t want to be the “owners” of Barcamp Africa as a name. From my conversations, they are hoping that other Barcamp Africa’s happen around the world (inside and outside of Africa). In fact, they wouldn’t even spend the $10 on registering the domain name, so I did that in their stead to make sure that no squatter would jump on it (it’s available to anyone who wants to use it). As anyone who has put on a Barcamp knows, it does take having a couple sponsors to put on a free conference. They’ve been talking to almost every tech company in the Silicon Valley trying to get them to sponsor the event – by either providing facilities or money for food, etc. After a lot of work, Google finally came on board to sponsor the facility (and they’ve got one of the best facilities around), so it’s a big win. Speaking of Google sponsorship of free tech events outside of the US, it should be noted that they happily sponsored our own Barcamp Nairobi in June, and showed up to participate in Barcamp Kampala in August. If anything, it should be the African tech companies who should be ashamed for not sponsoring their own local talent at these events. I’ve added my two cents in with the Barcamp Africa team of creating some way for people from around the African continent to take part. One of those ideas would be to set up a live stream of what they’re doing, but that’s not truly interactive. What would be even better is for them to setup one of the rooms where people from Kenya (or elsewhere) could signup for a 20-30 minute spot to address everyone in the US. Then, when your slot came up you could give a Barcamp talk just like everyone else. It would require a certain amount of bandwidth of course, but might be just the type of thing to get everyone involved.